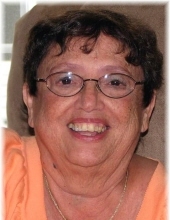 Catherine Rose Nestor, 79, of Batavia passed away peacefully on Saturday March 30, 2019 at Brothers of Mercy in Clarence. She was born on November 26, 1939 in Italy to the late Peter and Carmella (De Masi) Macheda. In addition to her parents, Catherine is predeceased by her beloved husband; Mark Nestor; sister Rose Pileggi. Mrs. Nestor was a teacher at Oakfield-Alabama Central Schools for over 30 years. She was an avid reader and loved nothing more than spending time with her family. She is survived by her daughters; Marie (Tom) Martell of Oakfield and Jennifer (Paul) Ko of Princeton, NJ; brother Vincent Macheda of Batavia and sister Frances Winicki of North Carolina; 4 grandchildren Olivia and Dylan Ko, Sophia and Malena Martell, along with several nieces and nephews. Family and friends are invited to call on Friday April 5, 2019 from 4:00-7:00PM at Gilmartin Funeral Home & Cremation Company, Inc. 329-333 West Main Street Batavia, New York 14020. A 9:30AM Mass of Christian Burial will be held on Saturday April 6th at Resurrection Parish 18 Ellicott St. Batavia, NY 14020. She will be laid to rest in St. Joseph’s Cemetery, Batavia. In lieu of flowers, memorials may be made to Disabled American Veterans at www.dav.org. For more information please call 585-343-8260 or to leave a message of condolence please visit www.gilmartinfuneralhome.com. Arrangements completed by Gilmartin Funeral Home & Cremation Company, Inc. 329-333 West Main Street Batavia, New York 14020. To send flowers or a remembrance gift to the family of Catherine Rose Nestor, please visit our Tribute Store. "Email Address" would like to share the life celebration of Catherine Rose Nestor. Click on the "link" to go to share a favorite memory or leave a condolence message for the family.